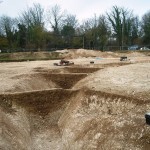 The following is taken from the website of Thames Valley Archaeological Services (TVAS) the company who excavated at West Meon in 2011. 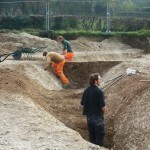 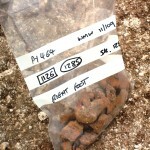 The TVAS archaeology team excavated an area on the outskirts of West Meon, Hampshire in advance of housing construction. 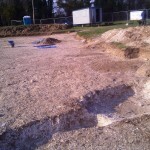 Preliminary work in the form of trial (evaluation) trenches identified a Bronze Age ring ditch and a small number of Saxon graves. 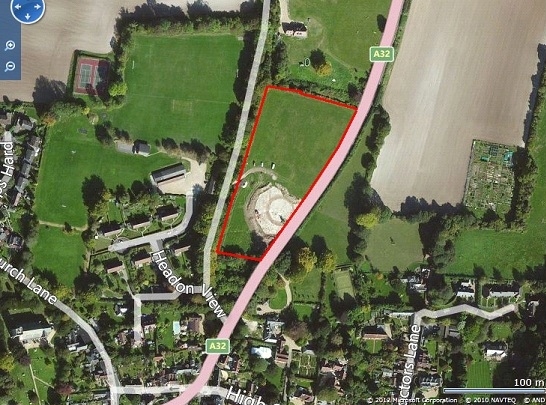 The team opened up the area around the ring ditch to identify its full extent and record and excavate it and any burials that may be at risk from the future development of the site. 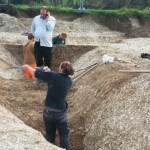 Once excavated, the ring ditch proved to be 29m in diameter with the ditch itself being c.3.5m wide and 1.5m deep. 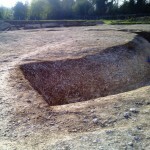 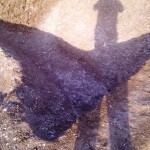 In the centre, which would have originally been built up into a barrow mound but has now been ploughed away, was a singe urn holding cremated human remains. 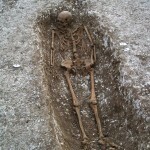 An un-urned cremation deposit was found on the lip of the ditch and a further urn was excavated to the southwest of the ring ditch. 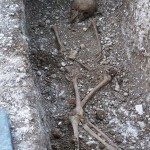 The style of the pottery suggests that the barrow probably dates from the early Bronze Age, around 1700 BC. 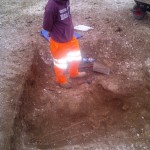 As the ring ditch was excavated the upper layers of fill were found to contain numerous struck flints. 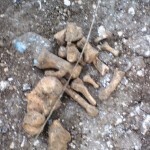 It appears that the flint nodules within the chalk from the ditch digging had been used as a convenient source of raw material for flint tools in the Bronze Age. 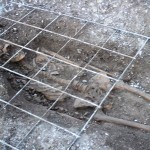 A total of 49 Saxon burials were found cut into the ground surrounding the ring ditch and even into the fill of the ditch itself. 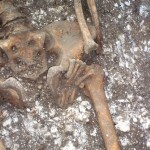 These are a mix of adults, teenagers and children who were buried in a variety of crouched and stretched out (extended) positions. 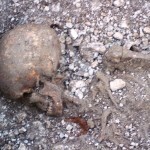 Some of the graves are orientated east-west but the majority are north-south. 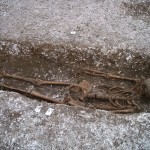 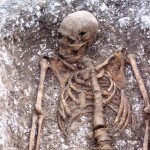 Several of the individuals were buried with grave goods including weapons, jewellery and tools which, when combined with the orientation of the bodies, strongly suggests that the burials are pre-Christian, probably from the 6th or 7th centuries AD. 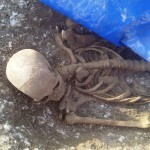 A site open day held while excavations were in progress proved very popular with the local residents and archaeological groups. 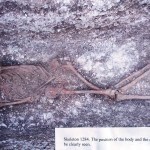 A series of posters were created detailing our findings and discussing two of the burials in particular detail. 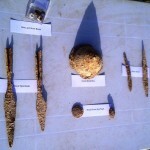 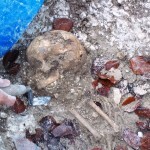 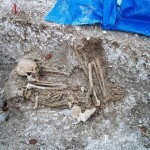 These, and images of the excavation can be downloaded from TVAS Educational Resources. 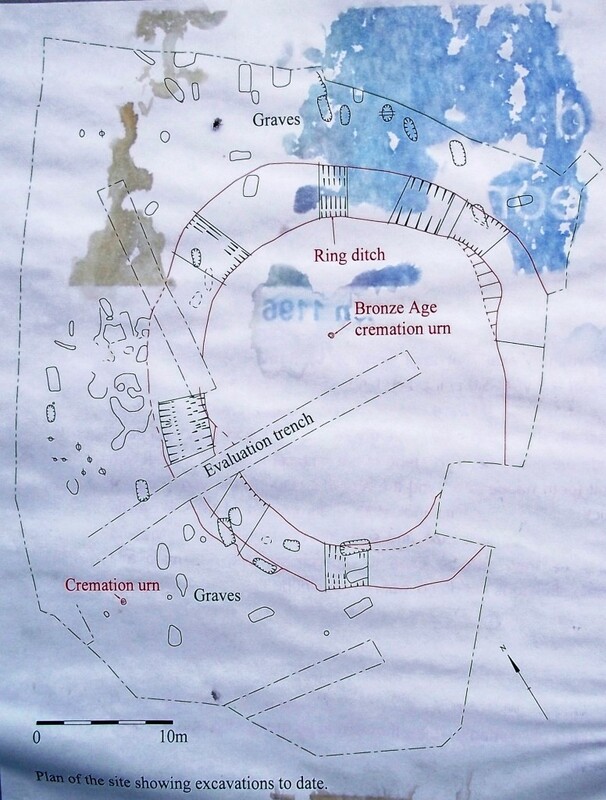 The image above (from The Heritage Journal) shows the scheduled area (outlined in red) with the ring ditch and Anglo-Saxon cemetery excavation being carried out in the lower half of the monument.